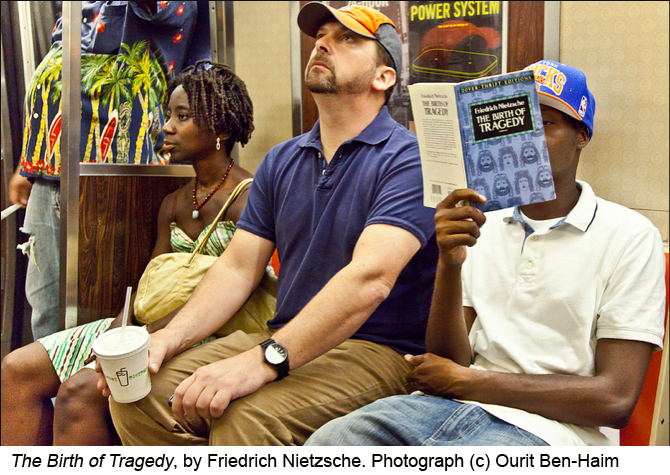 All the people heralding the death of the novel clearly haven’t traveled on the New York subway lately. 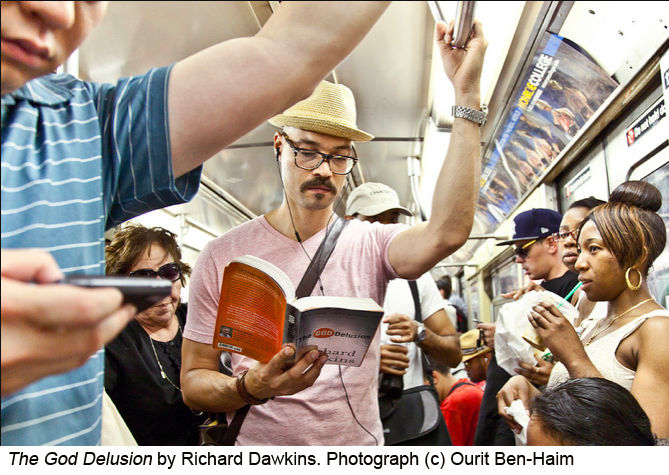 People are using their daily commutes to read—and not just James Patterson and Fifty Shades of Grey, either. Classics, philosophy, biography, contemporary literature: it’s all out there. 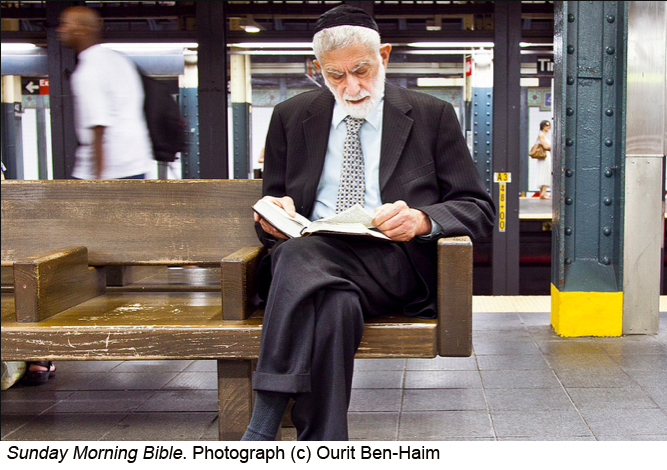 That’s the evidence gathered by Ourit Ben-Haim, a twenty-eight year old photographer whose project, Underground New York Public Library, has been getting a lot of buzz lately. The results are charming on many levels. First, in an age of sound bites and tweets, they show that New Yorkers’ intellects and attention spans are alive and well. Second, there are often wonderful surprises in what people are reading. 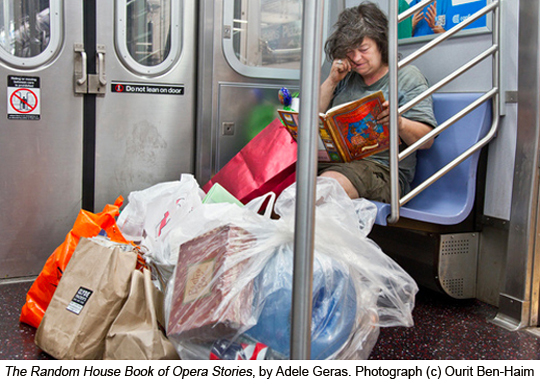 When you see a young girl absorbed in The Iliad, or a homeless person scanning a book on opera, you really have to move beyond stereotypes and look at each person as an individual. When Walker Evans photographed in the New York subway seventy years ago, he hid his camera in his jacket. By contrast, Ben-Haim is completely open. 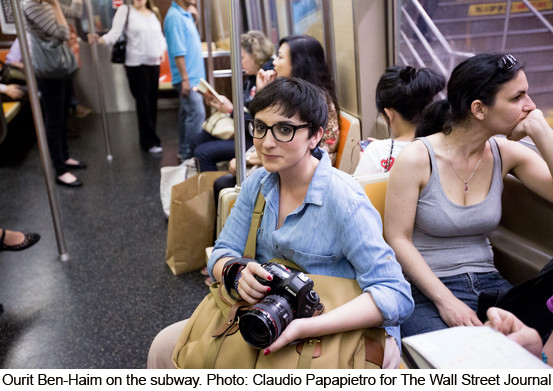 Photographing people in public places is legal, but still leaves some people uneasy. Because of this, Ben-Haim likes to interact with her subjects and won’t publish anything she feels would reflect badly on one of them. Reached by telephone this week, Ben-Haim was equal parts earnest and light-hearted—a bit like her images. She has received a lot of attention lately, with articles about her in the Wall Street Journal, Huffington Post and Publishers Weekly. She graciously took time to speak to The Literate Lens about her process and the way reading is changing. 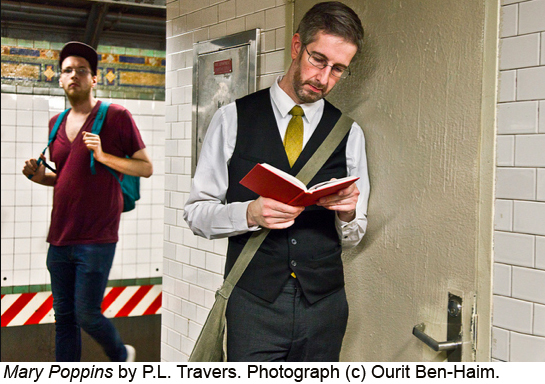 Literate Lens: Congratulations on your success with this project! Have you been surprised by the reactions? Ourit Ben-Haim: I don’t know if I’d say surprised. It’s been great, very rewarding. LL: When did you start doing this, and what inspired you? OBH: I started doing it in 2008, but more roughly at first. I was photographing initially with my mobile phone, and then at a certain point I had a collection that I looked at and saw a lot of potential. It relates to everything that interests me in my art, which is the inner world of the human being. For me, a successful photograph is one you feel you can enter into and connect with a person’s inner reality. I try to make each photograph that way. LL: One great thing about this project is that this is probably the last moment in history someone will be able to do this, because of the growth of eReaders. Did you think about that when you started? OBH: It’s not what I thought about when I was starting, but I realized it pretty quickly, and that’s why I put my project in full motion. I started to see the shift and realized I couldn’t procrastinate, I had to do it right away! 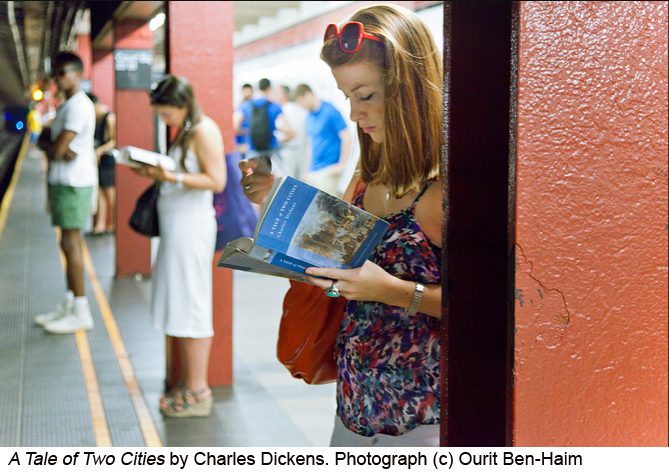 LL: Do you ride all the subway lines, and are there any that are particularly literary? OBH: I don’t play favorites with the lines! Part of my goal for this project is that it should be holistic and include as much as possible. So I hop on all the lines. As far as the more literary ones, that’s not an area I want to get into. Whenever I have the chance, I frame the image so that it leaves out the location of the line. I do that for the sake of the subject’s privacy. There is a more literary line, but that information won’t be revealed by me. I’m interested in specific pictures and moments. LL: I love that the books in the images are so often not what you’d expect based on the way the people look. For example, there’s a pretty young girl reading The Iliad, and a man in business wear reading Mary Poppins. Are you constantly surprised? OBH: Initially when I was doing it I felt surprised all the time, then started to think about my own surprise, and what that said about my preconceptions. Now I don’t feel surprised, just intrigued. When I found out that man was reading Mary Poppins, I just felt joy. LL: What kind of interaction do you have with your subjects? OBH: The point of street photography is to be invisible and not disturb the moment, so a lot of street photographers go for stealth tactics. My technique is that I’m very quick and I shoot very openly. Afterward there’s usually some interaction. I say, Hey, I just took your photograph, I’m doing a series. For the majority it’s no problem, it’s been very pleasant most of the time. There was one case where a man yelled at me, and a few cases where people said they’d rather not participate. But that’s very rare. 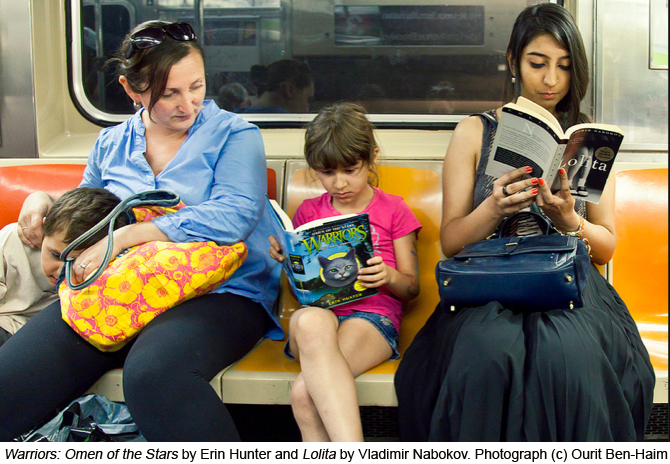 LL: What have you learned about New Yorkers’ reading habits? OBH: I’m really not approaching the project in terms of trying to figure out reading habits. For me, this project is not about reading. I know that sounds odd, because it’s pictures of people reading. But it’s about inwardness, inner reality. So I haven’t been thinking about reading habits–but the one thing I’d say is that we really shouldn’t have preconceived notions about what people might read. LL: How much of a reader are you? OBH: I studied philosophy and comparative literature. Reading has been a huge part of my life. LL: You now post a Friday eReader portrait. Do you feel there’s a difference between those portraits and the others? OBH: It’s a lot easier to photograph the eReaders, there’s more choice because they’re so prevalent. I also don’t have to decipher what’s being read. Otherwise it’s all just about connection. I also post a Sunday Bible portrait. The Bible is a great part of the culture underground, whether it’s people reading it or preaching about it. Since I was ending the week with the eReader, it seemed poetic to begin it with the Bible. LL: A lot of people say that eReaders kill the romance and connection of reading. Nobody’s going to start up a casual conversation about a book that can’t be seen. Do you feel something is being lost? OBH: I think with change there’s always loss and gain. With eReaders there’s that loss of visual connection, you’re not going to glance across and see someone reading a book that’s a big part of your life too. But doesn’t mean eReaders are evil. There are many gains: you can throw 20 books in your bag at once, and many people say they’ve read more since getting their eReader. Also I feel that although there may be a loss of romance from not holding a book, maybe there’s a deeper connection with the actual words because there’s nothing to distract from them. LL: You recently posted a photograph of a man you’d previously photographed reading Edward Rutherfurd’s novel New York. In the first photograph he was near the beginning of the book, and in the second he was almost finished. What was it like to encounter him again? Did you recognize him instantly? OBH: That’s definitely a very beloved moment, you could call that a favorite photograph. I did recognize him instantly. There was one time I approached someone and they told me their photograph was already in the library, and I was surprised because I don’t just snap and post. Each photograph is treated with care, I examine each one to make sure it’s right artistically and ethically. LL: What kind of ethical considerations do you give it? OBH: I approach it in a personal way, by imagining if I’d mind this photograph being shared if it was of me. Once I picked this great photo of a mom with her baby, the baby was looking up at her and she was reading, it was a lovely moment—but when I figured out what she was reading I felt it wasn’t right. Each photo has to be assessed in terms of how it would be received. LL: Speaking of things people might not want to be seen reading, have you seen the book Fifty Shades of Grey popping up a lot? I heard it’s selling at the rate of one book a minute. OBH: Of course! I know that book so well with my eyes, I can identify it from very far away by its shine, or the font. It’s not in The Underground New York Public Library, not because I’m judging the book, but from an ethical standpoint. I don’t want it to become a joke that someone’s reading it. However, this fall I’m planning to do a series of self-portraits with books that have become meaningful to me—and that book is certainly one of them, just because I’ve seen it so much. So I’ll be reading it in the self-portrait series, and I’m looking forward to the expression I’ll be making! Very interesting interview with the photographer. I wonder how many of the people she photographs would admit to missing their stop because they were immersed in their book. It’s happened to me a few times! Also, many people who appear to playing on their phone are actually reading! Great post and a fantastic project. Its a great concept and as you rightly say with the growth of ebooks the experience of reading in public is changing dramatically. I remember reading that at the beginnings of rail travel in the 1840-50s they actually stated that reading while on the train was bad for you because you weren’t able to focus on the pages properly while the train was in motion. That’s pretty funny, PP. Good detail for a historical novel. I can read on trains and planes but get motion sickness if I try to read on buses or in cars. I wonder if the early trains gave a bumpier ride? What a stunning set of photos. I am so taken with the sense of calm and relaxation in each frame. 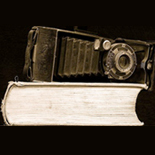 This entry was posted on July 27, 2012 by sarahjcoleman in Interviews, Novels, Uncategorized.